"This is a salsa my friend from Trinidad taught me when I was in the navy. We serve this at all Super Bowl parties and picnics in our family! Delish!" 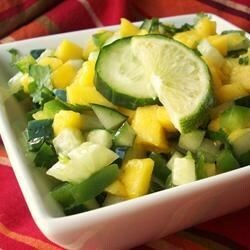 Stir together the mango, cucumber, jalapeno pepper, onion, garlic, and cilantro in a mixing bowl. Season with lime juice, salt, and pepper. Refrigerate at least 2 hours before serving to allow the flavors to blend. this was delicious. We added pineapple for more sweetness and a tomato just because we had it. Great over tequila lime chicken! I served this with pork tenderloin and it was a great accompaniment. Take the seeds out of the jalapenos unless you like LOTS of heat. It was a big hit at the last two BBQ's we have had. I've already given the recipe away...and I even had to use Mangos that were a little tart. I want to try it on chicken. great recipe. very easy to make. i served over grilled halibut and it was a hit all around. i've also made this recipe subbing in pineapple for the mango and it worked just as great. Really refreshing. We tried it with tortilla chips and it was ok. We made chicken breast on the grill and then used the salsa as our hamburger condiment....YUMMY!